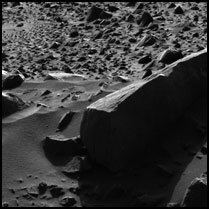 This image, acquired by the Mars Exploration Rover Spirit's panoramic camera on the 53rd martian day, or sol, of the rover's mission, struck science and engineering teams as not only scientifically interesting but remarkably beautiful. The large, shadowed rock in the foreground is nicknamed "Sandia" for a mountain range in New Mexico. An imposing rock, "Sandia" is about 33 centimeters high (1 foot) and about 1.7 meters (5.5 feet) long. The right image is a lightened version of the more artistic image on the left. The combination of the rover's high-resolution cameras with software tools used by scientists allows the minute details on martian targets to be visualized. When lightened, this image reveals much about the pictured rocks, which the science team believes are ejected material, or ejecta, from the nearby crater called "Bonneville." Scientists believe "Sandia" is a basaltic rock that landed on its side after being ejected from the crater. The vertical lines on the side of the rock facing the camera are known by geologists as "flow banding" and typically run horizontally, indicating that "Sandia" is on its side. What look like small holes on the two visible sides of the rock are called vesicles; they were probably once gas bubbles within the lava. The lighting not only makes for an artistic image, it helps scientists get a virtual three-dimensional feel for target rocks. Observations taken at different times of day, as shadows move and surface texture details on target rocks are revealed, are entered into modeling software that turns a two-dimensional image into a three-dimensional research tool. 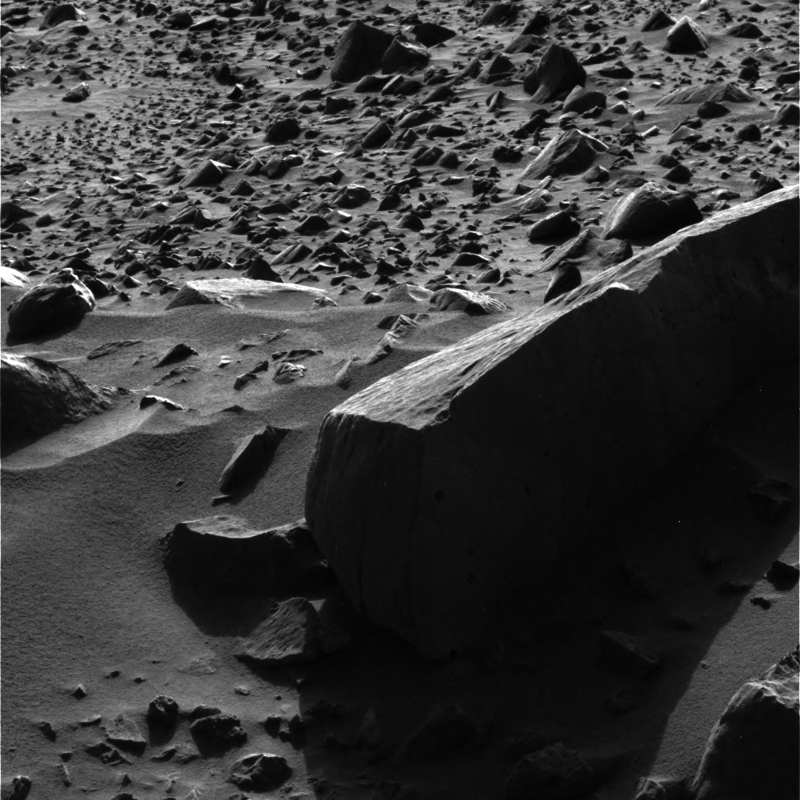 Many smaller rocks can be seen in the background of the image. Some rocks are completely exposed, while others are only peeking out of the surface. Scientists believe that two processes might be at work here: accretion, which occurs when winds deposit material that slowly buries many of the rocks; and deflation, which occurs when surface material is removed by wind, exposing more and more of the rocks.